Simulated ground motion for the 1976 Hangshan earthquake that resulted in the 2017 Gordon Bell prize. A numerical code, known as ‘AWP-ODC’ originating from SDSU Geological Sciences Professor Kim Olsen, and with contributions from SDSU Geological Sciences Professor Emeritus Steven Day and researcher Daniel Roten, as well as San Diego Supercomputer Center (SDSC) researcher Yifeng Cui and collaborators, was the basis for the 2017 prestigious Gordon Bell prize in supercomputing. The prize was given to a Chinese team for achieving 18.9 Petaflops (18.9 quadrillion calculations per second) on TaihuLight, currently the fastest supercomputer in the world. 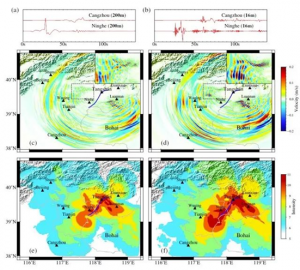 The team achieved the impressive performance of the code for a large-scale simulation of the 1976 Tangshan earthquake in China, estimated to have killed 240,000+ people. The open-source AWP-ODC code is used to simulate earthquake ground motions, and the achievement is a breakthrough for predicting ground motions that affect small homes and structures, which are vulnerable to high-frequency shaking. The simulation shows promise for using sophisticated numerical modeling codes, such as AWP-ODC, on today’s fastest supercomputers to estimate earthquake ground shaking and thereby contribute to mitigating the loss of property and lives from future devastating events. As recorded ground motion data used by engineers to design buildings are sparse for large magnitudes and close distances to the faults, such simulations may provide invaluable guidance for seismic safety in the future.